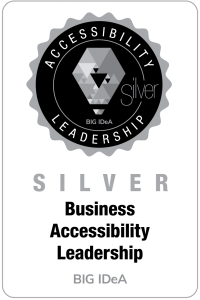 Any organization may choose to apply for one or more BIG IDeA Accessibility Badges. 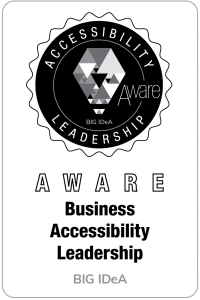 Completing any badge self-assessment application will result in an Aware badge for that accessibility area. 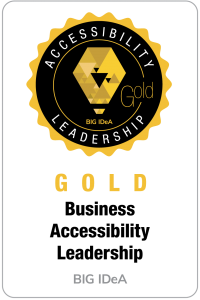 Organizations who have been thinking about and working on accessibility can also earn Bronze, Silver, or Gold badges. A Bronze, Silver, and Gold is issued based exclusively on the supporting evidence submitted upon request to support your application. An accessible business takes ownership and leadership for accessibility activities that go beyond compliance with legislation such as in removing attitudinal barriers toward disability communities; understanding and celebrating the values they can bring to society and participating onto the development of a more inclusive culture. Apply now to get a badge in this area. An accessible business organization integrates information and communication processes that are accessible to all people including PwDs. An accessible business organization sustains accessibility training and professional development for all staff in order to achieve and maintain an accessible and inclusive organization. An accessible business organization deploys inclusive processes in regards to employment cycle when dealing with potential/current/recurrent PwDs employees. An accessible business organization uses inclusive practices when providing/delivering goods and services toward PwDs. An accessible business organization provides an accessible indoor and outdoor built environment for all people including PWDS by ensuring no new barriers are introduced and current barriers are removed at all times.